The protests began after the government hiked petrol prices by 150%. Zimbabwe last month saw major protests and violent repression, some of the most severe in the recent past. The protests began after the Zimbabwe African National Union – Popular Front (ZANU-PF) government under president Emmerson Mnangagwa increased petrol prices by around 150% on January 13. The government came under heavy criticism from the opposition and faced stiff resistance from the people, who came out on to the streets in violent protests that brought the entire country to a standstill for days. 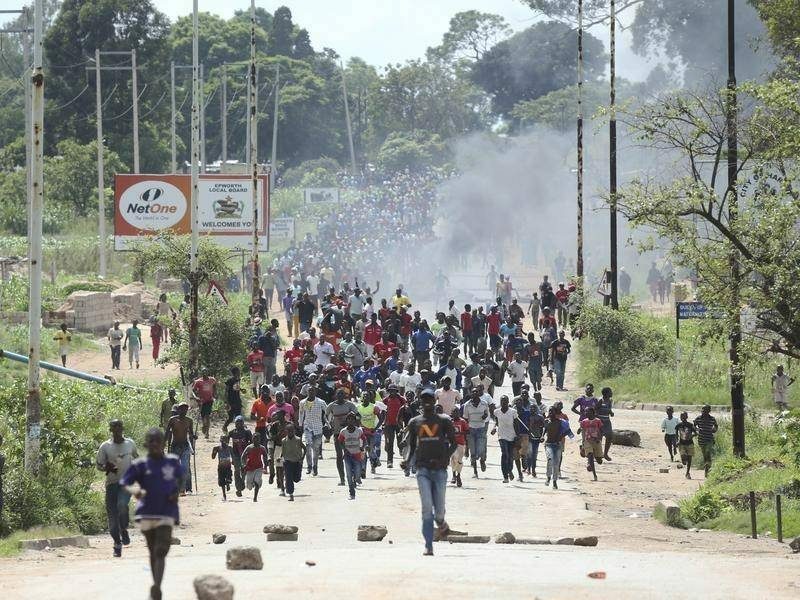 “The situation is a mix of confusion and anxiety”, says general secretary of the United Food and Allied Workers Union of Zimbabwe, Adonia Mutero, about the aftermath of the protests and the crackdown. Mutero does not mince words in criticizing ZANU-PF and the Mnangagwa government. At the very outset, Mutero explains how the petrol price hike is just the tip of the iceberg. “The heavy presence of the soldiers among the communities, barricades on main road and the visibility of armored cars” that have come to characterize the government’s crackdown on the protests, according to him, is an indication of an increasingly militarized government. The Mnangagwa government came to power after unseating Robert Mugabe in November 2017. Mugabe, who led Zimbabwe and the ZANU-PF since 1980, met with fierce opposition and was accused of corruption and nepotism for firing Mnangagwa from the position of vice-president, and attempting to replace him with his wife, Grace Mugabe, and seeking to pitch her as a candidate in the next presidential election. This prompted an inner-party struggle within ZANU-PF, which ended with the Mnangagwa camp forcing Robert Mugabe out of the presidency with the help of the military in a coup that was called Operation “Restore Legacy”. The party also kicked out Grace Mugabe and the Generation 40 faction of younger leaders, who supported her. The subsequent Mnangagwa government appointed Constantino Chiwenga, who had retired from the position of commander general of the Zimbabwe armed forces, as the vice-president and co-second secretary of the ZANU-PF. Mnangagwa was re-elected to the presidency in the general elections that were held in July 2018 in the first round itself, although his margin of victory was a mere 0.8%. ZANU-PF itself won around two-thirds of the seats in the lower house of the Parliament and got the most number of senators as well, solidifying the government’s legitimacy despite the circumstances of its emergence. The results of the general election were contested by the opposition that clashed with the security forces and even took the matter to the Supreme Court. The court disposed off the case in August 2018, by declaring the elections fair, since the opposition refused to accept a recount or even access the ballots for investigation, further reinforcing the government’s hold on power. As the government established itself, it struggled with a debilitated economy that is yet to get out a particularly severe episode of hyperinflation caused by the continuing multilateral sanctions from several western countries for its policy of land reforms that appropriated large swathes of agricultural lands owned by whites and distributed it to black Zimbabweans. Estimates of poverty in the country stands as high as 92%. While the inflation rate has stabilized at 0.5% since the dollarization of 2009, cost of living remains extremely high due to low wages and little to no employment generation ever since the sanctions were imposed in the early 2000s. Mutero says “With no increase in wages, the majority of the people will be living in less than 25 cents a day”. The government also has to deal with a high fiscal deficit that hit USD 3 billion in 2018, standing at 11.1% of the national GDP. The Mnangagwa government’s solution was severe austerity policies in its budget of 2019 to bring fiscal deficit to under 4%. These measures included freezing of wages of government employees, which it deemed to be the reason for the government overspending the budgetary limits by over USD 500 million in 2018. The over 150% jump in petrol prices is also one of the measures to bridge the deficit gap, which in turn is set to cause a surge in prices of other commodities as well. The government has little to no plans in generating employment or investments in the nation’s crucial social and industrial infrastructure, to even try to cushion the blow of austerity on an already stressed population. Talking about the desperate situation Mutero tells us “the effects of (the price hike) will be felt by the end of February 2019… because people are literally living on their last bits of savings”. He adds, “while we need long term plans, Zimbabwe needs short term measures that will let people put food on their tables”. The protests are much more than outrage over worsening living conditions. The people supported the coup of 2017 and Mnangagwa’s takeover of the government, expecting, as Mutero says, “a change from the old order of corruption, large-scale impoverishment and repression under Mugabe, to a more transparent, democratic and hopeful future”. The protesters of 2016 and 2017 against Mugabe government’s austerity measures expected the Mnangagwa government to repair the damage. But as the new government seems to be continuing the Mugabe era policies, the outrage was even greater. According to Mutero, the conditions have worsened so much in past year or so since Mugabe “that people are wishing for him to come… they say Mugabe is a better leader than the current ones”. On January 22, 2019, South African president Cyril Ramaphosa, who is seen as an ally of the current Mnangagwa government, blamed the international sanctions for the violence. Mutero notes that sanctions are “weapons of mass destruction… that never hits its intended targets, and only causes misery to the people”. But he believes that Ramaphosa’s call to lift sanctions on Zimbabwe is only to “take the focus away from the real issue of institutional corruption and the consequent economic mismanagement”. “Corruption is everywhere in the country, in our government, in our parliament, in our judiciary, and the worst in the private sector. There is a clique of business interests that has been here since the 1990s. It is a politically connected clique, which is in the business of sharing natural wealth of the country (among themselves). Unless we pass this cartel, no economic change, with or without sanctions can heal our comatose economy,” he adds. A important frame to see these recent events is the government’s relationship with the military. Many observers see the military as an extension of ZANU-PF the party, or the party as the extension of the military. The liberation war against the apartheid Rhodesian government had two political formations leading the militant struggle – the Zimbabwe African National Union (ZANU) and the Zimbabwe African People’s Union (ZAPU) whose armed wings were the Zimbabwe African National Liberation Army (ZANLA) and the Zimbabwe People’s Revolutionary Army (ZIPRA) respectively. ZANU and ZAPU came together as the Patriotic Front (PF) to overthrow the apartheid government of Ian Smith. By 1980, both ZANLA and ZIPRA had merged to form the Zimbabwe Defence Forces. With the merger of ZAPU, which was then PF-ZAPU, with ZANU-PF under Mugabe in 1987, the government and military were consolidated as part of the same political spectrum, with the same political aims. The current vice-president and the organizer of the 2017 coup, Chiwenga himself served in the ZANLA and is among the celebrated heroes of the liberation war. Under 37 years of Mugabe’s leadership, the connection between the military and the ruling party remained, even though they were two separate constitutional entities. Most military leaders maintain a very close political and ideological affiliation with ZANU-PF. This is one of the reasons why during the political crisis of 2017, the Mnangagwa camp approached their allies within the military. Chiwenga’s immediate ascent as a politburo member, the vice-president and co-second secretary, despite having officially joined the party only after the coup, is illustrative of that fact. Under Mugabe, the military’s policy with the civilian government was largely that of non-interference. As a party, ZANU-PF held control over the command over the armed forces much like any other civilian government. Or at least, that is how it seemed, until the 2017 coup. But after Mugabe, with the induction of Chiwenga into the national leadership, the government is seen to be making concessions to keep Zimbabwe from falling into a military regime. Chiwenga enjoys the loyalty and confidence of the military, despite having retired. According to Mutero, there have been rumors that with the army’s involvement in suppressing the protests, the military was set to unseat the Mnangagwa government and replace it with one led by Chiwenga. Of late, reports have also emerged of discontent among the military itself, with salaries and supplies of officers and soldiers also being hit by the austerity measures. In December, during a parliamentary session on the budget, defense minister Oppah Muchinguri, while talking about the fact that the military only has one uniform per person, happened to hint at a coup if concessions were not made immediately. But so far, the military or Chiwenga are yet to make any overt public gestures that would seem like they are unsatisfied with the government. If anything, Chiwenga’s presence comes across as the one big reason why the military is still submitting itself to the Mnangagwa government. But the increasing unpopularity of Mnangagwa and his austerity policies among the people have caused much concerns within the ZANU-PF itself, with murmurs of support tilting towards Chiwenga. Recently, as reports came of Chiwenga being airlifted several times over the past week to India for some unspecified medical treatment, there was a visible panic within the rank-and-file of the ruling party. The government had to go overboard to convince everyone that there is little to worry about Chiwenga’s health. Whether or not one agrees with the ouster of Mugabe from the leadership of the government, what is undeniable that the balance of power in the aftermath has been unsettled. The ZANU-PF under the Mnangagwa and his supporters did take a significant risk by bringing the military into the matters of the state. The next few months will tell us how the fledgling democratic institutions of Zimbabwe will deal with all of it.